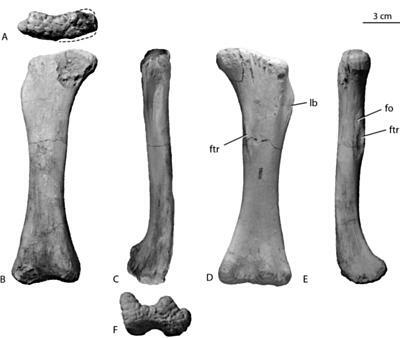 Right Femur (98002) A, proximal view, posterior to top; B, anterior view; C, lateral view; D, posterior view; E, medial view; F, distal view posterior to top. Right Femur (98002) A, proximal view, posterior to top; B, anterior view; C, lateral view; D, posterior view; E, medial view; F, distal view posterior to top. fo, fossa possibly for the insertion of part of the m. caudofemoralis; ftr = fourth trochanter; lb, lateral bulge.